THE guilty verdict handed by the Sandiganbayan on plunder charges against former Philippine president Joseph "Erap" Estrada felt almost anti-climactic. Like many others, I too expected the verdict, especially with the overwhelming documentary evidence and eyewitness accounts like those of former EPCI banker Clarissa Ocampo, showing who was the true owner of the Jose Velarde account. Or she could probably endorse the presidential pardon to the next President, who will probably come from the Opposition camp anyway. (Hmmm...let's see...Manny Villar? Mar Roxas? or ick, Loren Legarda?) Anyway, memories of Filipinos are short, and we are generally a forgiving lot. A presidential pardon in Erap's case could work too except that I doubt that he could reinvent himself the way Nixon did, who went on to become a prolific author, speaker, and well-respected elder stateman. 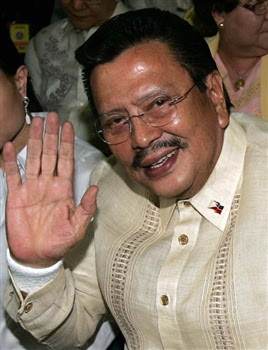 Maybe Erap could resurrect his film career and make a movie based on his trial or have someone ghostwrite his memoirs. A few chapters devoted to his paramours would make the book an instant best-seller. Seriously, this country needs closure in the political arena. There are just so many issues still hanging out there that are keeping us as a nation from moving forward, e.g. the Ninoy Aquino murder, the Marcos millions, the Hello Garci scandal. (It's a good thing that Marcos has finally been buried because that too, was one closure we needed.) The guilty verdict on Erap and a subsequent pardon could be the start of a turnaround for us. I really don't know about this as the start of a turnaround for the country. Each day new issues come up and hardly any ever get resolved. Keep the faith Viking. We'll get there yet.